Sorry I didn't get this posted yesterday. Here's Lu - just hanging out! Don't you love it when they sit like little people, proud of their assets? Oh my gosh, that is hysterical! He looks like he's hungover. Oh my, he IS just hanging out, isn't he? Poor Lu, he looks grumpy and undignified! Great pic! I love when my cats sit like this! Very dignified!! Our Lily sits like this often..we call her our little bar tramp!! OMG! What an awesome photo! Lu, cheer up baby! Hilarious! I still think I'm going to steal this cat at some point. These pictures are always fun! Just so relax! Don't you just want to tickle that little belly though? LOL! He does look like the lolcat on my post today. That's hilarious! 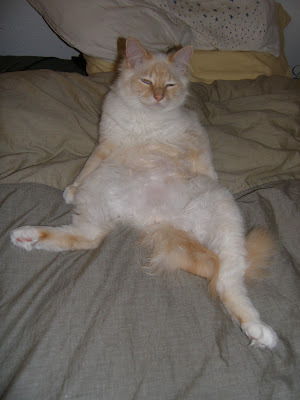 I think it's hilarious when cats sit like that. It's like they should have a drink in their hand with how relaxed they look. He looks like he just had a little too much to eat. LOL! I agree with Sarah he should have a drink (and a cigarette) in his paws. That's too funny!